When I look for pedal deals, the first criteria is obviously price. If it’s a good price… it’s a good deal. But sometimes I look at the bang-for-the-buck option as well. Sometimes you’ll see really nice deals with bundles. Basically, I like to see price on the pedal bundle to match the pedal cost alone at other stores. With a bundle you’ll get free items with the pedals. Usually cables, etc. Well, I found one, and this time it’s the TC Electronic Dark Matter pedal bundle. In this bundle you will get the TC Electronic Dark Matter Distortion, 2 10′ instrument cables, 2 patch cables and pick card for only $129.00 at Amazon. Normally, you find the pedal alone for $129.00, so you can think of it as free cables and pick card. This also ships free with super saver shipping. The TC Electronic Dark Matter Distortion Guitar Effects Pedal aims to give you that powerful, super-musical roar of an early Plexi – a sound that will satisfy even the pickiest players out there. From cleans with an attitude and warm bluesy tones to a crunch with grit for days and fully saturated lead sounds full of harmonics and overtones, it’s all here and instantly available by riding your guitar’s volume knob. Dark Matter distortion is built from the highest-grade components, features an easy-access battery hatch and has a conveniently small footprint. By ramping up the voltage to more than 3-4 times the amount of your typical drive pedals, a dramatic increase is achieved in terms of headroom and dynamics. There is plenty of gain to suit any kind of musical style, but the sound always stays very open and clear and it will never get muddy or cover up your playing. 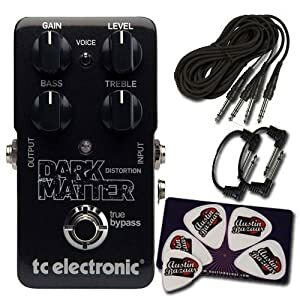 You can pick up TC Electronic Dark Matter pedal bundle for only $129.00 at Amazon. You can find the pedal by itself for $25 less at amazon.